STC measures sound penetration through a wall in the 125 Hz - 4 kHz range. However, typical audio systems create sound from 25 Hz - 20 kHz. Sub-woofers can pump out high dB sound from 25 Hz - 125 Hz depending on your system. This can create a situation where a high STC wall will do little or nothing about your low frequency sound. 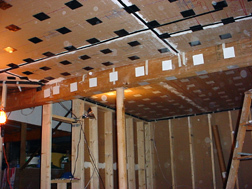 If you are planning a soundproofing project, understanding how high powered audio behaves in your room is critical to making an informed decision. Real world acoustics goes way beyond standardized lab test data. In particular, STC (Sound Transmission Class) can be very misleading, particularly in the area of high powered audio applications. To begin with, STC only measures the the amount of vocal range sound that is stopped by a wall. Note that the VOCAL RANGE is a fraction of the full bandwidth AUDIO RANGE played by most modern sound systems. STC does not really apply to today's audio system. In addition, STC is only a measure of how much vocal sound can be stopped by a wall. But that's not the end, it's just the beginning of the story. The sound energy that gets stopped by a wall, doesn't go through the wall, and that means it ends up staying inside the room. Now there is too much sound lingering inside the room, the lingering energy from one sonic event ends up covering over the perception of the next sonic event. Ever heard of sound masking? Sound masking is usually associated with a steady background noise being introduced so that people can't hear conversations across the room. Here, the masking energy is due to the lingering storage of high density, rapid fire audio tracks. The audio, much more than voice, tends to become self masking, and the higher the STC becomes, the stronger the self masking effect becomes. It works the same way in high STC rooms, where less sound is let out of the room than is being delivered to the room. A human voice can deliver about 50 dB of continuous sound power. A movie sound track can deliver easily 80 to 90 dB of continuous sound power. That's about 5000 times more energy than the human voice. If this energy is held in the room by high STC walls, the sound quality inside the room starts to become garbled. In high performance audio systems, two things usually matter: Keeping sound from bothering the neighbors and getting clear sound inside the room. As you can see, the better the STC rating, the worse the quality of sound inside the room becomes. What to do? NRC is the answer. NRC (Noise Reduction Coefficient) is the measure of the sound absorption in side the room. 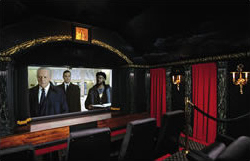 STC measures how much sound is kept inside the room and NRC measures how much sound is absorbed inside the room. A low STC room leaks a lot of sound and to maintain good sound quality inside the room, to keep things from getting garbled, not much, a low NRC is needed inside the room. But, like STC, NRC is also measured in the voice ranges. STC and NRC are both voice range measurements, used for general architectural acoustics. They occupy the middle 6 octaves in the bandwidth of human sensitivity to sound. Today's high power audio systems cover the full bandwidth range, 2 octaves lower and 2 octaves higher than the vocal bandwidth. However, if the room has a high STC, too much sound is kept inside the room and the room has to be "treated" so it has a high NRC, to get rid of the stored sound so that the sound inside the room isn't too garbled. An extremely high STC room, an underground concrete bomb shelter has a very high STC, over 100 dB. Since the sound has nowhere to go, it stays inside the room, lingering for 10 to 15 seconds. Generally, a room has to have an NRC of at least 15% to be acceptable for conversation. For high power audio, the required NRC goes up to about 40%. 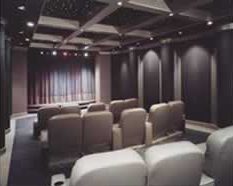 At ASC, we have developed the complete solution to high power audio room acoustics. The interior surface of the room is constructed with a medium STC surface, the type that best supports high power audio playback. On the other side of this low STC wall surface, we apply a high STC rated wall surface to achieve the necessary overall STC for the wall. Furthermore, our interior wall is very unique. It is "non-tympanic" in that it does not twang when excited, or hammered by high power loudspeakers. Our interior wall does not store energy. A standard wall thunders when thumped. A standard "soundproof " wall thunders even more when thumped. 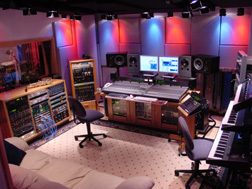 In high performance audio rooms, thundering walls are not acceptable. Our interior wall is interlaced with constrained damping materials, which absorb structural vibration energy. Our interior wall is light enough to let some deep bass pass right through it. But to do so means the interior wall is moved. And the structural damping compound takes over and absorbs the energy right out of the wall movement.